Welcome to the Best Places on Earth. Welcome to the Best Places on Earth! 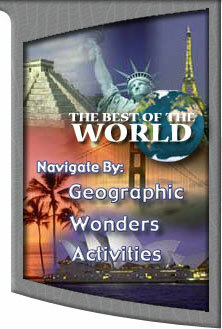 Here you can virtually explore the destination of your choice, anywhere in the world! Our site is growing fast so return often and discover new feature destinations. You can visit the top ten travel destinations using the buttons on the left, or explore the world by clicking on the collage to the right. If you wish to receive information on traveling, please fill out our Travelers Information Request Form. If you have a world-class travel destination site, submit it for inclusion in this directory, or for an opportunity to win the coveted BPOE Award - fast becoming the industry standard in identifying quality travel destination oriented sites. If you have any questions or comments, or would like additional information about any of the travel destinations we feature, feel free to contact us using our online Contact Form.